Plastic is inextricably linked to our modern lifestyle. Over the past 150 years, this extraordinary material has radically changed the society we live in. However, its durability and strength are a threat to the environment: each piece of plastic that has not been collected or reused still exists somewhere, lost in nature. Global data points to the increased use of plastic. Showing the environmental consequences associated with this use was our main concern in this Museo Mundial installation. It is also possible to understand the efforts of development actors to address this challenge through Millennium Development Goal (MDG) 7 ("Ensure Environmental Sustainability"). In 1992, the first United Nations Conference on Environment and Development, the "Rio Summit", took place. It was a turning point, in the late 20th Century, in the discussion on reducing human impact on the global ecosystem by following the principles of sustainable development. What will be the turning point in the 21st Century to avoid the depletion of the Global Commons? Through two creative and visual installations, we sought to raise awareness on the excessive use of plastic over the past decades and thus promote the adoption of more sustainable behaviour through reducing and reusing plastics. The first installation, measuring 160 cm in height and 40 cm in diameter, was sealed with plastic in its interior and placed on a movable base. On the outside of the structure vinyl stickers were placed. Together they form a visual chronological chart showing how many tons of plastic were used between 1960 and 2010, and the projected use of plastic up until 2030. Since this first installation, placed in the museum's garden, was vandalized, it was necessary to create another one. Therefore, we created a system of different transparent bags. 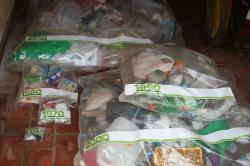 These bags are filled with the plastic objects from the first installation. So, for the 1970s a one-litre bag was used and filled, for the 1980s a two-litre bag, and so on until the year 2010 for which we have a huge 30-litre bag. The last 50-litre bag representing today is yet to be totally filled. Visitors are asked to leave recyclable plastic in the last bag that represents today. When we speak of plastic, we think of bags, packaging and toys, but we must also consider the microplastics in our toothpastes or cosmetic products. Their microspheres are diluted in the sewerage system and the treatment plants are not equipped to filter them out. What is the result? An imminent danger to the oceans. Every year close to 100 million tons of manufactured plastics end up in the sea. Hence, we have more than 200 tons of plastic in the ocean. 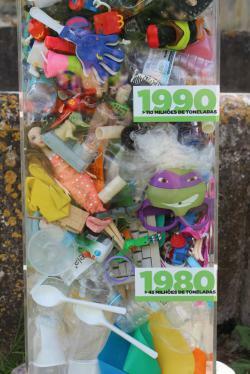 The result is that turtles and seabirds are killed by plastic fragments. In total, over one million birds and marine animals die each year from ingesting plastic or becoming trapped in it. Drawing attention to the excessive use of this material was therefore our main concern. It is important to ensure that our topic, as well as the approach that we want to take to it, fits well with the space chosen inside the Museum (by being consistent with the artefacts already exhibited in that space). This can be achieved through the relevance of the object, the name of the room or a whole set of factors that must first be identified. 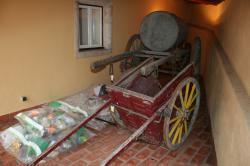 The most visited areas in the museum should be the main candidates for hosting the MDGs installations. In our case, many museum visitors visit the cafeteria and gardens. Therefore, we chose the garden, contrary to the premise that the museum consists only of its interior space. This choice later turned out to be a mistake. We contacted potential suppliers and presented an outline of our idea. Since this is a project consisting of a set of ten installations, it was essential to maintain an overall coherence in the graphic design. Ensuring that agreed deadlines are met is also vital. In addition to the installation, we needed to identify appropriate support materials. As an example, the leaflet/booklet allows visitors to deepen their knowledge on the subject. What to say: whenever possible you should opt for more visual language (computer graphics) as this is easier to understand. The leaflet/booklet allows readers to reflect on the subject. Leaflet: the draft brochure was available within the specified time frame and was approved by the team. In addition to providing global and local facts and figures on plastic, we reflected on the qualities of this material and focused on the consequences of not recycling or not reusing plastic waste: a disastrous impact on the environment. The connection between the installation and the history of the museum is also outlined in the leafletYou also get information about this topic on subject-specific websites. Since it was a garden installation, the leaflet was placed in the Museum’s reception area. The structure was designed to give visitors a clear image of how plastic consumption has increased since the 1950s. At first, we wanted to present the significant increase in the use of plastic by showing both the quantity and the type of plastic used in each decade between 1950 and 2010. Dividing the structure would be very expensive, so we agreed on a transparent box that allowed visitors to see what was inside it. The 160 cm (height) by 40 cm (diameter) structure was sealed with plastic in its interior and placed on a movable base, which can be moved whenever necessary. On the outside of the structure vinyl stickers were placed. They formed a visual chronological chart showing how many tons of plastic were used between 1960 and 2010 and the projected use of plastic up until 2030. We fulfilled the requirements to give visibility to our financial supporters. However, since the structure was placed outside the museum and exposed to the elements, high winds damaged the structure during the first month of the exhibition. The team managed to restore the installation’s structure, leaving it in the same spot. However, it was vandalized three weeks later. After this happened, the project team met with the museum’s educational service, which chose to recreate the entire structure and place it in a different location. 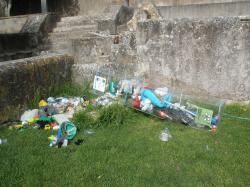 So, in July, all the plastic that was inside the first structure was transferred to a new installation. How could we maintain the visual representation of the excessive use of plastic over decades and ensure that the facility continued to meet its objective of raising awareness? Faced with this challenge, we created a system of different transparent bags. These bags are filled with the plastic objects from the first installation. So, for the 1970s a one-litre bag was used and filled, for the 1980s a two-litre bag, and so on until the year 2010 for which we have a huge 30-litre bag. The last 50-litre bag representing today is yet to be totally filled. This new installation was placed next to a dustbin from the 1950s (which is part of the Museum’s permanent collection).Actually this area was not available for visitors.. Now, we are promoting a new tour circuit that is interactive, as visitors are asked to leave their recyclable plastic waste in the last bag that represents today. Note that the vinyl stickers with information on the amount of plastic (per decade and in tons) were moved to the respective plastic bags. During April and May, several formative and informative pieces of content on the environmental impacts of the use of plastic, climate change and the action each of us can take to preserve the environment, were promoted via the main channels of communication (Facebook page: "Connected for the Better World"). We started the campaign with a teaser on Earth Day, by posting a video addressed to future generations in which we apologized for the damage caused to the planet. The promotion of the installation has been boosted through the use of a Flashmail, released in conjunction with our partners. It is a very visual email that invites people to visit the installation and learn more about the project. The installation has been widely disseminated through social networks and also through the social networks of other institutional partners. The location of the first installation in the Museum's garden created a strong visual impact. When confronted with the installation, visitors had a very clear notion of the amount of plastic humans use and the impact this consumption has on environmental sustainability. Connecting the installation to the Museum piece (a 1950s dumpster) was successful. This link reinforced the dynamic between local and global aspects of this issue. The rehabilitation of the installation was carried out by the Museum’s educational service, which built a sense of ownership. The use of plastic objects in the plastic bags of different sizes increases the visual impact. This tool is more interactive, as visitors are asked to leave their own plastic objects in the last bag. Although it was designed for outdoor use, the installation structure was too fragile. The leaflet could not be made available near the outside installation. The strategy to show the significant increase in the use of plastic was different from the initial one that had the purpose of showing both the quantity and the type of plastic used in each decade between 1950 and 2010. Dividing the structure by decade would have been very expensive. The location: access to the installation in the new location is dependent on the Museum’s staff or security guard since this area is not open to the public. The installation was moved to a room located next to the Museum’s main building. There is no sign to draw attention to the room or to the objects inside. We should take more time to develop our ideas. Although we considered displaying the installation in a more public place, we neglected safety issues. Furthermore, the installation format proved not to be suitable for an outdoor space: the winds affected a structure that was both high and mobile and was placed in the middle of a garden without any protection or cable to hold the structure in place. Positive feedback on: the thematic “plastic oceans”; the awareness-raising on how the use of plastic is increasing; attractiveness; creativity; strong visual impact; effectiveness; mobility; informative. Negative feedback on: difficulty in understating the data; writing is not legible; fragility of the structure; little interaction; lack of a framework to contextualize the information.